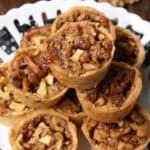 Easy mini muffin pan apple pies loaded with crunchy walnuts! The best bite-size Thanksgiving dessert. Place cream cheese in a large mixing bowl and beat with an electric mixer just for a few seconds until smooth. Beat in the 1/2 cup softened butter until smooth then beat in the granulated sugar and 1/4 teaspoon salt. Then beat in the flour. Cover the dough and refrigerate for about 20-30 minutes or until chilled. Divide the dough between 24 cups of a lightly greased mini muffin pan. Using your fingers, pastry tool, or handle of a wooden spoon spread the dough up the sides of each cup to form a thin crust. Place back in the refrigerator while you prepare the filling. In a large mixing bowl, mix together the brown sugar, eggs, melted butter, vanilla, cinnamon, and salt until well combined. Stir in the chopped walnuts and apple. Remove the crusts from the refrigerator, and spoon the filling into each cup of over the crust. Bake the pies at 350 degrees F for about 25-30 minutes or until golden brown around the edges. Cool about 5-10 minutes then run a sharp knife around edges of crust to remove. Cool pies slightly on wire cooling rack before serving. SNAPPY TIPS: Mini muffin pans can vary in size, so if you may have some filling leftover depending on the size of your pan. SNAPPY SUBSTITUTIONS: Instead of cinnamon, you could substitute apple pie spice. Instead of apples, you could also substitute pears.